Here is the Earlier we had reported that Android Nougat Source code is released and you may see CyanogenMod 14 ROMs too but we are still unable to believe that it will be available this much early. It’s just the first week of release of Android Nougat code and we have a big list of Available CyanogenMod 14 (CM14) Nougat 7.0 ROMs and many AOSP Android Nougat custom ROMs also available for various devices like: Galaxy Nexus, Nexus 4, Nexus 5, Nexus 6, Nexus 7, Nexus 6p, OnePlus One, Xperia M, Xperia SP, Xperia Z5, Jiayu S3 Plus, Galaxy TAB S 10.5 Wifi and Tab S 10.5 LTE, WileyFox Swift, Symphony Roar A50 (Android A50) and LG Optimus G.
Yes the world had many AOSP Nougat ROMs but none of the CyanogenMod 14 Nougat ROM was available yet or we might have missed from the internet source. But now it is Rohan Purohit and faizauthar12 are the developers behind the first CyanogenMod 14 Nougat ROM brought to Xiaomi Mi 4i. Currently the status of this ROM is not known but we can expect this could be an early CM14 build with more bugs. Of course there will be more CM14 ROMs in the coming days; this is just the inception of CM14. AOSP code release is one thing and merging CyanogenMod code to AOSP codebase is entirely a different thing. Of course the AOSP code was release a week back but the CyanogenMod 14 code is still being merged and may not be completely ready. Developers are too fast to deliver CyanogenMod 14 ROMs in lightning fast speed. YOu must appreciate their work must wait patiently to get usable ROM builds. 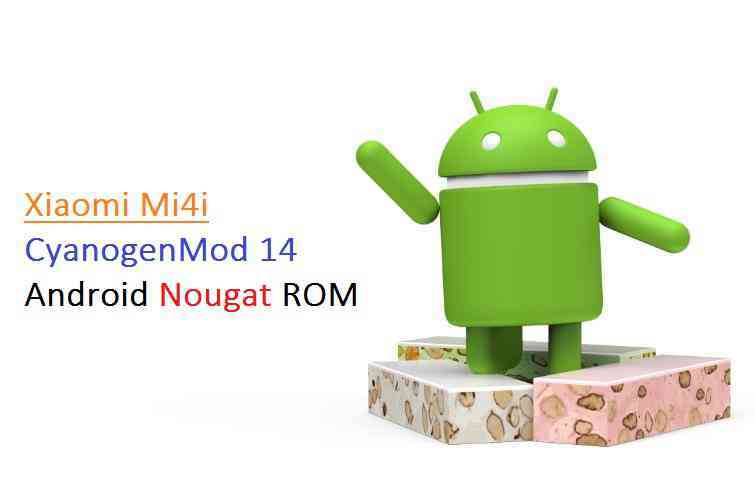 With this Mi4i CyanogenMod 14 release you can expect many more CyanogenMod 14 based Android Nougat builds at the CM14 tag. Stay tuned to us to get the latest Android Nougat ROMs for your devices or else you can search for your Device forum and if you don’t find your Device in our forum’s list then you can request for a New Device Forum.